Gradall Industries, Inc., will feature its highly productive TrackStar Railway Maintenance Machines at Bauma 2019 from April 8-14 in Munich, Germany, where thousands of global manufacturers present their latest innovations on the world stage. The Gradall display also will feature the XL 4300V, a versatile rubber-tire hydraulic excavator that is exceptionally mobile on paved surfaces as well as rough terrain. TrackStar railway machines, equipped with rail gear, can also move quickly over rails, pavement and dirt. Gradall will be located at FS1104/2, co-exhibiting with Rivard, another Alamo Group company located in Daumeray, France. With a wide range of attachments available, these Gradall models handle a variety of construction and maintenance jobs thanks to their low-profile telescoping, tilting booms. Without the need for outriggers, Gradall machines can dig, pick and carry at the front, rear and either side of the carrier. TrackStar machines are used to build and repair rail crossings, clean up landslides, replace rails, spread ballast and cut back overhanging trees and other vegetation. XL 4300V excavators also can excavate, grade, move materials, trim tree limbs, clean up after storms, clean out ditches and more. On both families of machines, the short rear tail swing and low-profile telescoping boom create a compact size, allowing the Gradalls to work efficiently under bridges and inside tunnels where knuckle booms won't fit. Gradall TrackStar machines can be quickly driven to rail crossings, where carriers are positioned over the tracks. 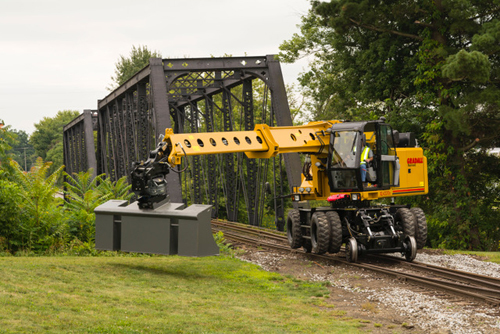 The rail gear system is easily lowered into place on the tracks, allowing the machine to move easily to repair and maintenance locations. The standard guide rail system uses the carrier’s wheels for mobility and extra stability while digging, replacing rails and ties, or moving material. Travel speed is 18 to 20 mph with this system. An optional hydrostatic drive rail gear system, with wheels raised, speeds the machine to job sites at about 14 mph. When working, wheels can be lowered for enhanced stability. A host of standard operator cab features include air conditioning, removable front window, a large, adjustable seating module and a switch to select Gradall, SAE or Deere joystick patterns. Highway speed carrier advantages include an automatic transmission. Machines have almost 70 percent parts commonality, simplifying the task of maintaining inventories to complete common service functions. These machines also have longer routine service intervals, and most service locations can be reached from ground level. A network of authorized distributors supports all Gradall excavators, supplying service advice and authorized Gradall parts.